Three participants of NIMD’s Young Political and Civic Actors Training Programme in Jordan were selected to take part in a meeting with the country’s Prime Minister, H.E. Hani Al-Mulki, and his Ministerial team. The three participants, Hamzeh Hyassat, Rand Muhammad and Ahmad Ghraiz, were among 150 youth representatives selected from different governorates in Jordan. The meeting was organised by the Ministry of Youth and aimed to make youth voices heard, addressing the challenges young people face and helping to solve their problems. 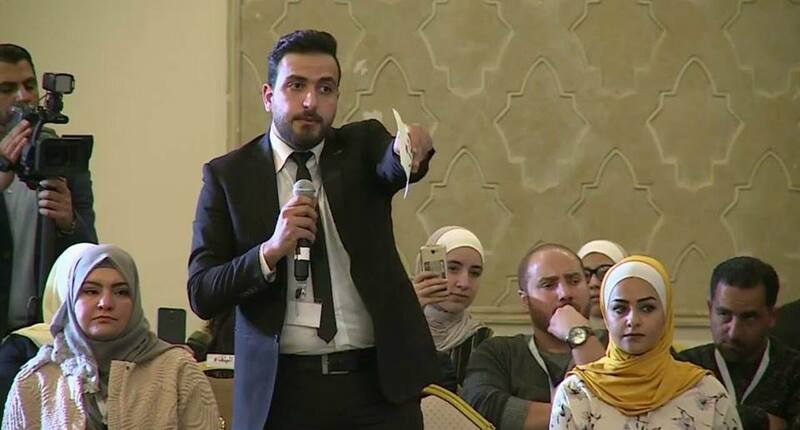 Having been trained on communication skills and speech delivery, Hamzeh Hyassat was chosen to represent the youth from Balqa Governorate and speak on their behalf. Hyassat spoke on the economic challenges currently facing Jordan. Hamzeh provided accurate statistics on budget deficit and other relevant data, which was part of the training the youth received on analysing data and using convincing arguments in influencing public opinion. Rand Muhammad and Ahmad Ghraiz shared their ideas and thoughts on the importance of engaging youth in politics. During the meeting, Minister Musa Maytaah spoke on the role of the government in creating an environment for political parties to flourish and increasing youth political participation. He outlined recent laws which aim to increase citizens’ political participation. He also mentioned that the Ministry is in the process of issuing a new by-law on State Subsidies to Political Parties. EU Support to Jordanian Democratic Institutions & Development’ Programme (EU-JDID) supported the Ministry in facilitating three workshops with the 47 registered political parties in order to discuss the potential modification of the by-law that regulates state subsidies to political parties. The annual Young Political and Civic Actors Training Program is implemented by NIMD as part of the ‘EU Support to Jordanian Democratic Institutions & Development’ Programme (EU-JDID) project. The training programme is organized in cooperation with the Jordanian Ministry of Political and Parliamentary Affairs.